Is anyone else taking a summer vacation from quilting? I haven't sewn a single stitch since Memorial Day. The last top I pieced, I hated. Thought it was time to clean up the sewing room and close the door for a few weeks, which has now turned into six weeks. I have thumbed through magazines and do check in here on QB a couple times a week. Did go to the sewing room one rainy day this week and looked through my stash. Still no incentive. I guess the feeling will come around again. Until then, I'm at the lake, swilling ice tea, eating ice cream, tanning my toes and enjoying my Kindle and the warm breezes. Life is great; it just isn't "quilty". A couple years ago was my time away. Just would not make myself go in the sewing room. hand work was it a snails pase. have been working my way back, but not gone to work myself back to feeling like not gone to the sew room again. Help your time away will be short for you. Some times you just gotta shut the door and move down the hall and out the back door and go to the lake! My summers are usually to full to really get anything new started. Grand's take turn spending a few weeks with us, garden always needs weeding, family coming and going, This year my Mom's health has not been good, being the family Taxi service, cause I don't work, Really??? LOL still have the same quilt on the design board that was there in May! haven't done a thing but look at it in passing! Oh well September is coming! Can't get any quilting or piecing done when I'm exhausted. Weeding, strawberry season, thistles to deal with in the horse pasture, rain gutter cleaning, mowing, trimming, and working part-time. Oh, on a rainy day I finally tackle house cleaning! It's our get-aways up to the cabin where I've been able to dive into some piecing & quilting. When the outdoor work winds down, I'll feel rested enough again to start on my projects. 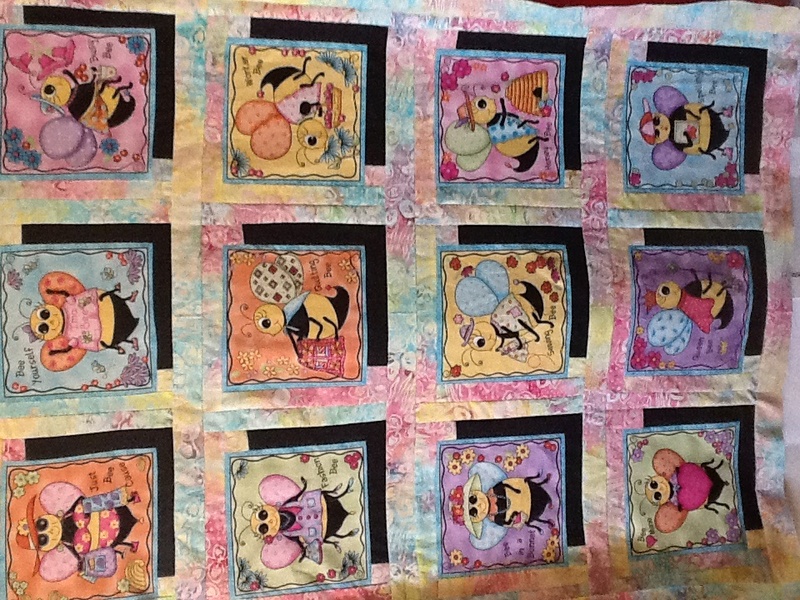 Finished a quilt today, been very slow going,guess it is the hot weather. I'm having a forced break. I moved to my girlfriend's house in the middle of June. It's crowded and I just don't have room to work on anything. I'm going to move again so it could be fall before I have a chance to work on anything again. Actually, since I teach school, summer is when I have the time to enjoy doing some sewing. Of course, our children are grown and in their own homes and we only have one grandchild who goes to daycare. I imagine my summer sewing routine will change in the years to come. Sometimes the summer heat just robs me of energy to do much of anything...but I always feel the itch to get sewing or organizing. IN my case, I need to cutup a lot of scraps. Next true heat wave and I'm heading for the cool basement with a bag of scraps and a rotary cutter! Have taken a "forced" vacation. Had the grandkids for 3 weeks, then had to play catchup for a while. Did spend another day with a grand so she could finish a bag for school. Have been busy spraying weeds and will start haying in the next couple of days. Guess that is why I sew like a demon when I can. I had aa forced stop last year due to 2 ops at both ends of year. As hand therapy began hand work and applique. I have just done a machine sewn top. Take a look. I was a teacher for 40 years and we always had our surname initial plus year group. I was 2B for many years. " to be or not to be that is the question" was frequently quoted. I just couldn't resist this panel I have cut up. I get less sewing done in the summer, but not by choice. Since I work 2 part-time jobs, I must use most of my free time to mow, work in the garden, and can the produce. However, this year brought extra challenges...dealing with ill parent/in-laws, son's AND daughter's weddings...the list goes on and on. Oh, for an uninterrupted day of sewing!